Although New York Fashion Week's focus is to promote new collections there is a lot happening behind the scenes relating to vintage! Barneby's are on-site covering the weeks events from a vintage perspective. We managed to catch the founders of celebrated vintage chain of boutiques What Goes Around Comes Around between the racks for an exclusive interview! 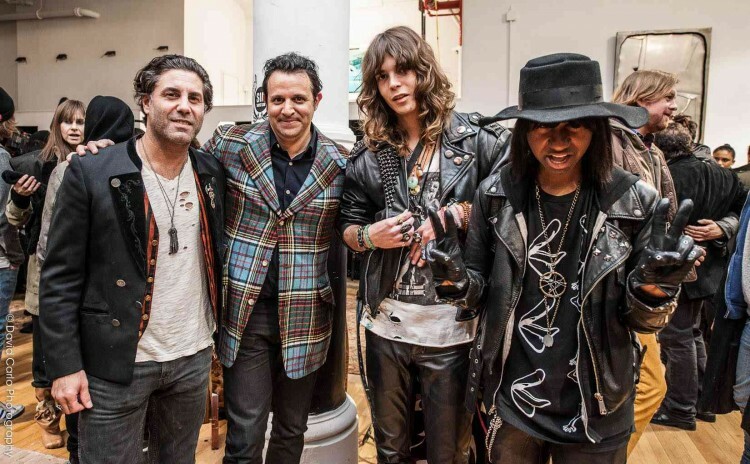 Gerard Maione and Seth Weisser opened the vintage retail fashion store What Goes Around Comes Around (WGACA) in SoHo, NYC in 1993 and in 2008 they opened an LA location. Setting high standards for the vintage goods WGACA's buying team travels the world hand selecting the finest items from the most coveted fashion brands. In addition WGACA also maintains an appointment-only Archive to service the fashion industry, housing one of the most extensive vintage clothing and textile libraries in the world servicing vintage aficionados, editors, stylists and the industry's top designers. How did you get into the vintage clothes & accessories scene? After we graduated from Syracuse university, we moved to the city to find work. We were supplementing our salaries with vintage and realized that most shops had no merchandising- no pizzaz. We wanted to open a vintage store with a point of view that was curated with a lifestyle in mind, so we did. What is the difference between buying new and vintage? One of the largest differences is the quality. Most vintage pieces were made with stronger fabrics, many details or the entire production are hand made. In addition, many of these pieces are one of a kind at this point; there isn't a rack of the same shirt in 50 other stores across America. What is your favorite era and why? Who is your style icon? We're obsessed with 60's rock here. Gotta say Brian Jones and Keith Richards. Mick Jagger too. What is the best find you have made at an auction, where and at what price? We found the most insane Hermes bag made of mixed materials in exotics and leathers, multi-colored in a pop art sort of way with an asymmetrical lean. It is one of the most spectacular bags we have ever seen. We got in Japan, as for the price, gotta keep some secrets! What are you busy with during NYFW? We are all over the place! We are booked with buying appointments at our showroom as everyone is in town for the shows. In addition, we hosted a party Monday night at the store to celebrate with a retrospective on Azzedine Alaia! It was an amazing night; Lana Del Rey, Francesco Carrozzini, Taryn Manning and the entire Dexter-Jones family were among our guests! Check out Fashion & Vintage on on Barnbeys here.